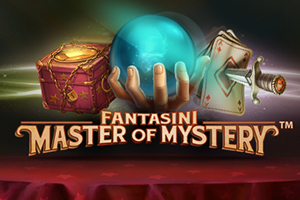 The Fantasini: Master of Mystery slot uses the story of a great illusionist as its theme. Not only does it have an exciting theme, but it also has 243 ways to win and some cool features. Upon opening the slot game, we expect that you’ll be pleasantly surprised at the high-quality graphics. NetEnt has done a great job designing this slot. The background of the reels is what you’d expect to see if you were a magician looking out from the stage. If you look closely, you can even see the audience. There are 5 reels with 3 rows, as we mentioned above there are no pay lines. Instead, all 243 ways to win are permanently engaged with every spin. The symbols on the slot game range from playing card values to items that you’d typically find in a magician’s bag of tricks. Landing multiples of the poker values will net a return, but it will be less than with those which are theme related. These symbols include poker cards pierced with a dagger, gold handcuffs, a crystal ball, a trunk covered in chains and the magician’s assistant. In addition to the regular game features, the Fantasini: Master of Mystery slot has an autoplay feature. It saves you from having to respin after every single spin. Instead, you can set the bet and then set the number of spins that you want to run in succession. Although on the Fantasini: Master of Mystery slot there are no lines to bet on, there are still two other tabs involved in placing a bet. You’ll have to select your coin size and the level. As you toggle both, look to the left of the screen to where the word ‘bet’ is displayed in white letters. When you’re happy with the amount, select spin. There is only one bonus symbol in the Fantasini: Master of Mystery slot game, and it’s the wild. As you may have guessed, the wild is covered by the magician; Mr. Fantasini. He is able to substitute for all other symbols in the slot game. It will give you a higher chance of landing a winning combo. There is no scatter symbol in this game. Linked Reels is a feature that is perhaps most well-known from the Twin Spin Deluxe slot by NetEnt. When you spin, there is a chance that up to five reels could be fused together. Even if there are just two reels linked together, both reels will display identical symbols. The inclusion of multiple identical reels is a huge bonus when playing for matching combinations. Although there is no bonus symbol in the Fantasini: Master of Mystery slot game, the base game gives you plenty of opportunities to land a payout. Other great NetEnt online slots that you may enjoy are Butterfly Staxx or Theme Park: Tickets of Fortune.